This was my husband’s table, and I’m on a mission to replace all of his furniture find a piece that would provide some storage, something my very open-concept house is sadly lacking. I am happy to announce that Wish List Project #10 can officially be crossed off the list! I found this cabinet at a thrift store a couple of weeks ago. I paid a bit more for it than I normally would have wanted to, but you’ll see there’s a reason this cabinet had to come home with me! 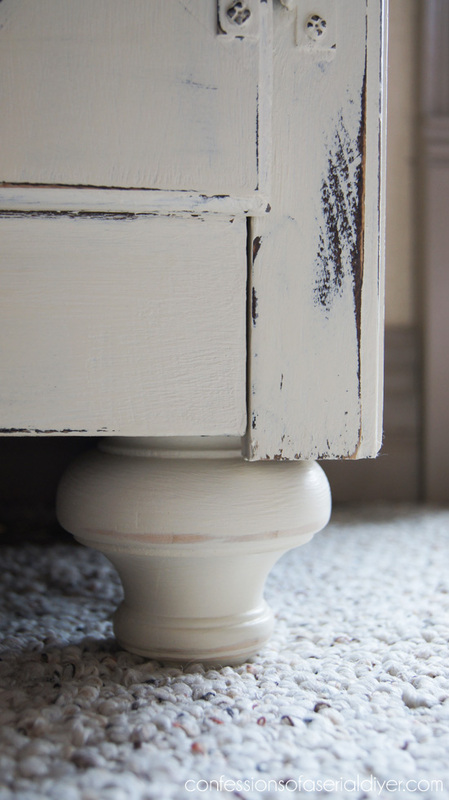 This is Annie Sloan Chalk Paint in Old White with clear wax. I added feet to dress it up a bit. I thought the dark hardware was a nice contrast the light cabinet. I really liked the original hardware but one of the handles was broken. Have you figured out why I just had to bring this home? It’s also a sewing table! I love to sew because it’s such quick gratification. I’ve been sewing since I was about 12. I remember going to the fabric store with my mom and picking out my pattern, carefully assessing and gathering what I needed for my project. I also used to make and sell dolls, all of which I created the pattern for. I sold a lot of dolls, ya’ll! Maybe I will share some of them one day. 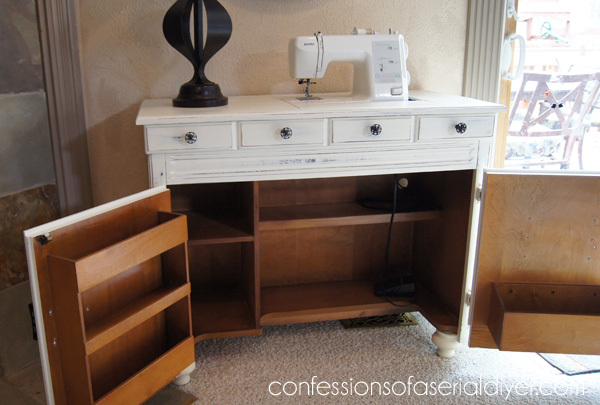 So you see, I was delighted to discover that this adorable little cabinet that is also a sewing table! I’m not sure if my machine will attach to the top, so I can just fold it down into the table, but there’s plenty of room to store it underneath too. You can see I also reattached the thread holders that I spray painted black. The inside is in perfect condition, so there was really no need to paint it. I don’t have a craft room, so all my sewing notions and fabric are stored in a cabinet in the garage. Now I can bring them inside for much easier access! This cabinet also came with a sewing machine attached (which I tried to leave at the store in exchange for a discount on the cabinet, but they said no). I didn’t need another machine, but it looked like it was in decent condition. Do you know what I discovered about this machine? 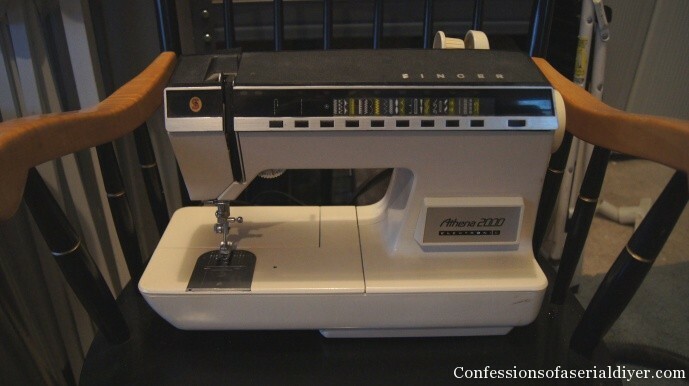 The Athena 2000 was the very first electronic sewing machine made by Singer. It retailed for about a $1000 in the late 70’s! Can you see these fun stitches it makes? There’s a wave, leaves, flowers, and even a little dog. I played with it a little, but I was only able to get it to sew a straight stitch. Pretty fun though, huh? Now to find a sewing project so I can try it out! I love this cabinet! I would love to find one of these for my house…so handy! 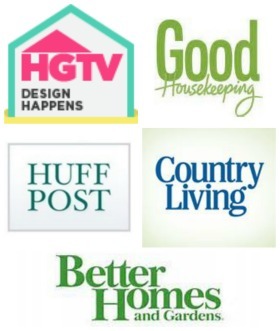 I featured your project on my blog today! That is the most beautiful sewing table I’ve ever seen – so original! Thanks Suzan! I just couldn’t leave it at the store not just because it is pretty, but also functional! I can’t believe you only paid $90. It’s perfect! I love your paint job on it. Really made it’s personality shine! Great job! 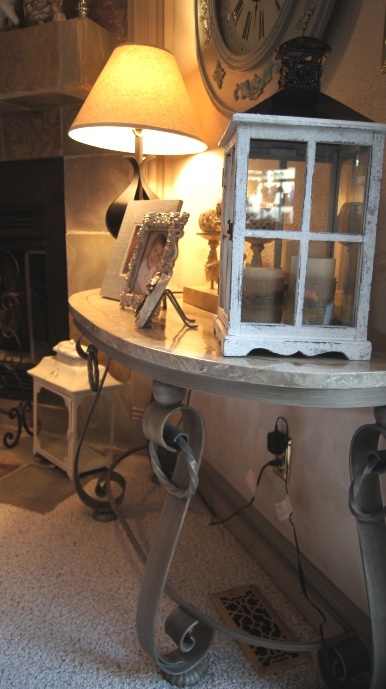 I love this I have a side table I’m going to redo soon and am looking for inspiration. I was thinking distressed, for some reason myhubby loves that look so this is good for me to see. Plus I’m jealous of all the organization in it! Holy Cow! I am sure there are lots of sewists out there who would love to grab the machine and the cabinet it came in for a mere $90. That is a steal, if what I read is correct. The sewists (I read three blogs, one of which is 10,000 Hours of Sewing, Diary of a Sewing Fanatic, and Tanit Isis Sews ) are always on the lookout for “vintage” machines that were designed to do fantastic things that only specialist type of machines (or very expensive machines) can do these days. I’m glad you didn’t paint the inside of the cabinet. No one sees the finish inside the cabinet anyway, it’s not like you sit with the cabinet doors open and everyone stares constantly at it and say oooh, aaah, I just LUV what you did to the inside of the cabinet, Christy!” If the finish is fine the way it is, why do it over? Just for the heck of it? Nope, don’t get it, and I probably never will 🙂 I think your Athena is a major SCORE! BTW, your redo of the outside of the cabinet is lovely, and I do like the addition of the feet to the cabinet. Really does finish it off, and you had to do something if you wanted to keep it in the same spot as the prior table, over that (1) REGISTER or (2) AIR RETURN and still have the register or vent usable. A very smart adaptation. Ooh! Great find. I would love to put that piece in my house. I always hate lugging my machine in and out of storage. That probably makes you put off sewing projects, I would imagine. I just had mine in the garage, but it still seemed like an inconvenience to have to lug it in and set it up! Beautiful!!! Found you over at the inspiration gallery at crafty, scrappy, happy! I have NEVER commented on a blog before…but I just had to tell you about my sewing machine and cabinet. 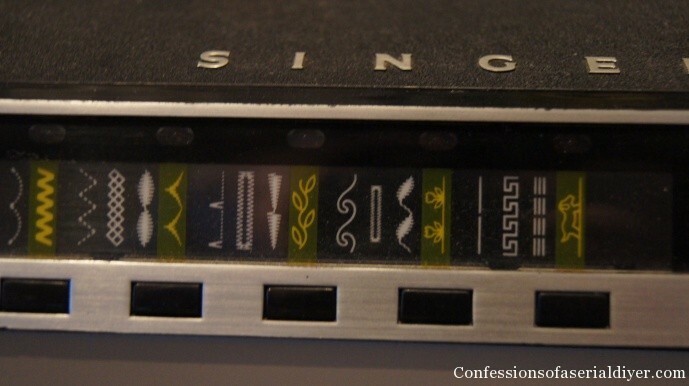 I have a similar cabinet with a Singer 2001 Touch-Tronic machine that came out in 1979. It was the first purchase I made with my first paycheck after graduating nursing school. 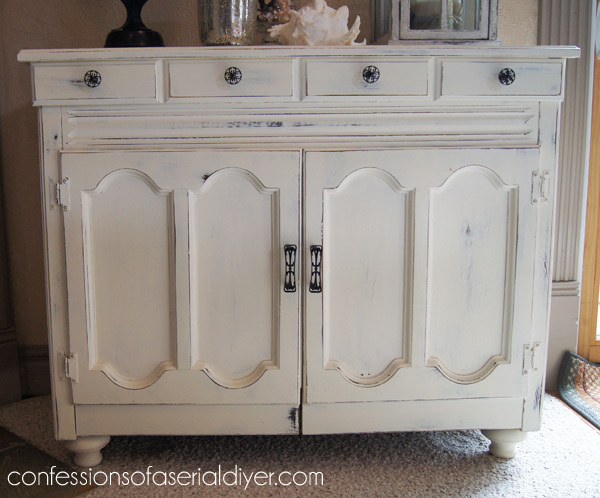 This past summer I gave the cabinet a makeover, inspired by Miss Mustard Seed. I painted the cabinet cream, stained the top walnut and added old bronze bin pulls and crystal knobs to the doors. My machine still works great. I proudly told my husband last night as I was sewing that I’ve had the machine longer than him! (We’ve been married 28 years.) I think it might be worthwhile to research (google) your machine on the internet. It might have a reset button for the electronic stitches and I do think there might be a market for the machine. As I said I’ve had mine for Yikes! 34 years! Kind regards and have a blessed day! PS. I might have to steal your idea to add feet! Hi Linda! Thanks so much for sharing about your machine! Looks like we have something besides sewing in common; I’m a nurse, too:) I love furniture that is redone to maintain the beautiful finish on top. I wanted to brighten up that corner so I painted the top on mine. Thanks for letting me know about the reset button. I’ll have to check that out. I purchased the feet from Home Depot for around $8 each if you’re interested. Your cabinet is amazing! Wonderful job 🙂 I also had the Singer Touch-Tronic. That machine lasted me for 20 years. I made everything under the sun on that including full-blown pull-string drapes and all the curtains and draperies in our house. I handed it down to my daughter two years ago when I bought a brand new Janome. The Singer is still going strong and she loves it! Beautiful! I wish I could find a sewing table like that! I love the feet too! I love it and I think you got a deal! I have some friends that have been working on machines for years. You might find someone who works on machines that could get it going for you. Those stitches might be fun!! Wow What a surprise inside! 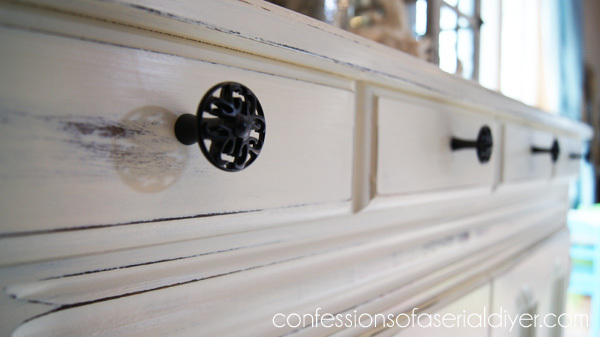 I love the cabinet and the fact that it is a sewing cabinet makes it even more awesome! great update, love it in white. that’s a niced sized sewing table too! storage is a MUST! 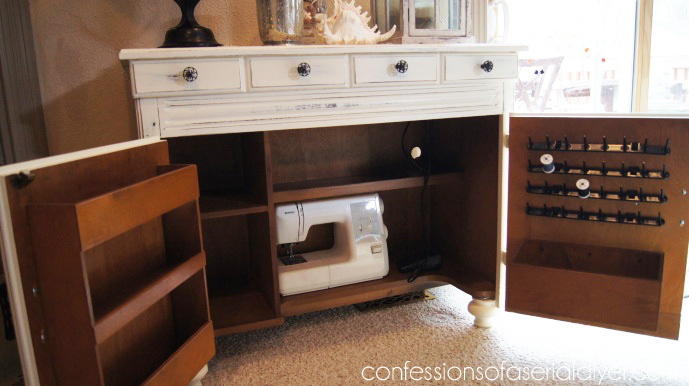 I have seen a ton of sewing cabinets over the years, but nothing like that! 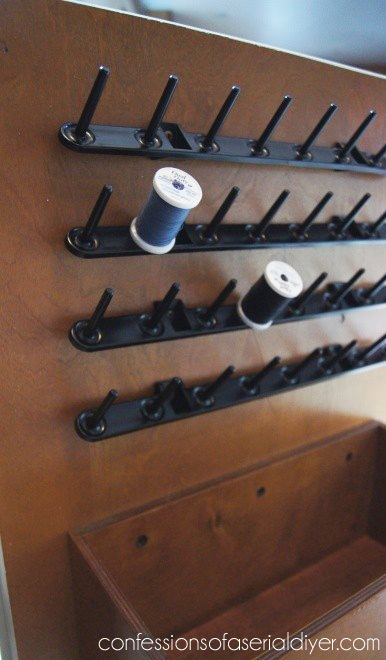 It’s fantastic and can double as a buffet or sideboard if you ever give up sewing. Lovely! Thanks, Jenny! You are right…it has a lot of storage underneath too! That is the most beautiful cabinet I have ever seen. Great Job! I never would have guessed a sewing machine was hiding out inside! Must be nice to have it right there, and not have to drag out of the closet (like me!). Nice job! Wow! It looks beautiful now. I have never seen one of those sewing machine cabinets before. I love the makeover! And the sewing machine looks pretty cool too, I hope you can get it to work. You just gave me an idea too… with a little tweaking I think one of these old sewing cabinets would make a great kitchen island!? Wow, you just gave ME an idea!! The back of this is also solid wood so you might have a great idea there! Great job! Paint changes everything! And so handy! I never would have guessed it was a sewing table. Great transformation! Please share your project at http://www.creativecraftsthursday.blogspot.com each and every week and check out what other creative divas are up to. This is great, I really love the used look on the parts that would have wear over time. It being a sewing table as well was a huge wow factor to this article as I was reading along. Thanks for the walk through on this awesome item. Enjoy a good sew. Hi Christy! I’m loving looking at all of your projects! 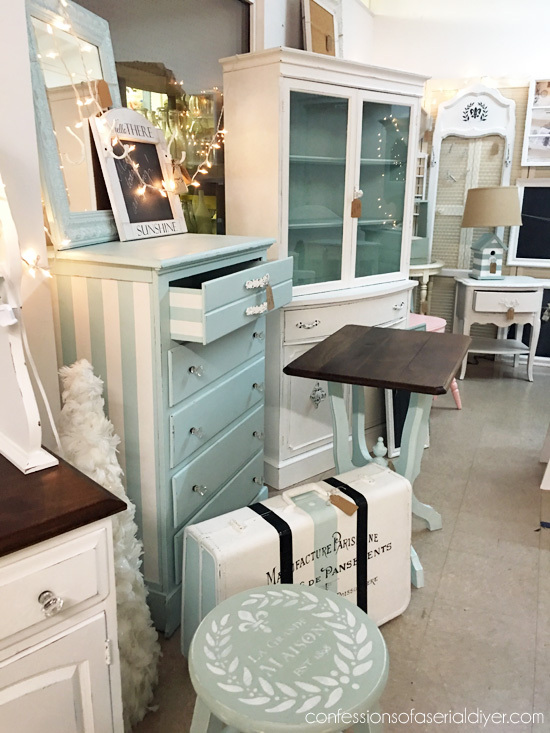 I’m so inspired now that you make it look so easy 🙂 Could you share your tips on giving your furniture that “distressed” look after painting, like on this cabinet? I know there are many different ways but I love the way your pieces come out so just wondering what your method of choice is. Thanks! So so helpful, thank you!! And what is the purpose of the clear wax? I haven’t heard of that technique before. One more question… This cabinet looks tall to me so im wondering if you use a bar stool height chair or is it low enough to use any standard chair? Thanks for your time! I am so glad I found you. 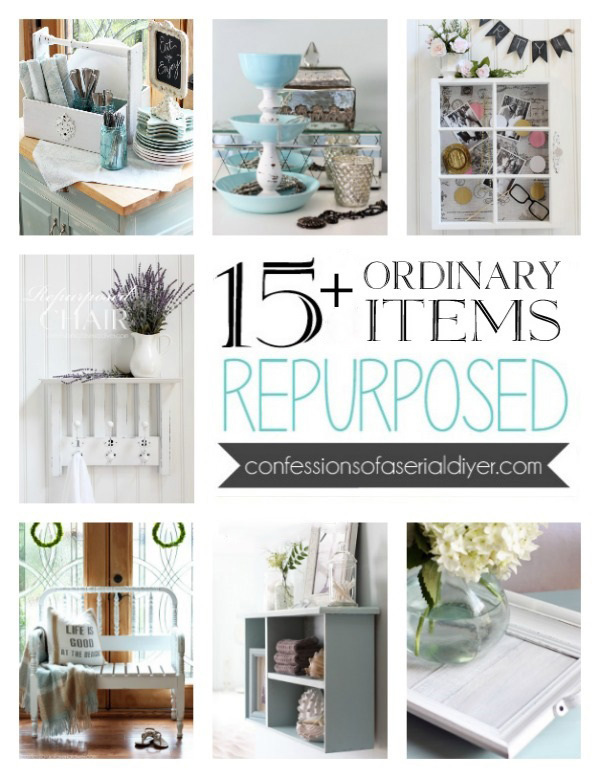 I love all your furniture redos. You keep me going with my garage sale finds. Keep up the encouragement…. 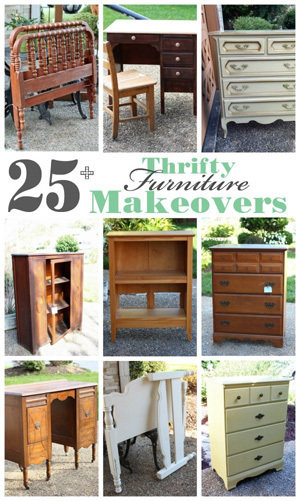 Christy, your sewing cabinet makeover is so beautiful that now I want to learn to sew. Just looking at it, I would have never thought that it had a secret identity. You did such a great job on the makeover. I’m so glad you shared it with us at Throwback Thursday! I never would have guessed that this piece is a sewing table. The storage it gives you is so handy! I really like the white paint and new hardware that you chose for its update. Thanks for sharing with this week’s Throwback Thursday party. Christy, You are a doll for sending me these pics! They are so helpful! Thank you so much!!! You’re right in that my monster of a machine is too big, but still could sit up top and take advantage of that cool back ledge that somehow forms when position it that way. It would make a great ledge for the fabric to lay on while sewing and free-motion quilting especially. Again I love how you finished it and the hardware you put on it is so pretty. Do you happen to know who made that cabinet? I’m Sorry, I don’t see any markings. I have the EXACT SAME CABINET! 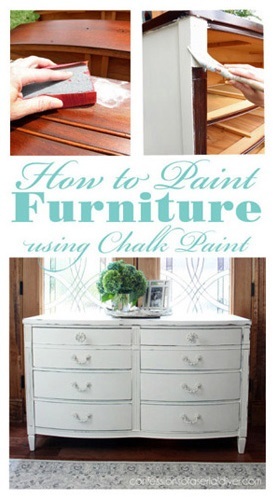 I searched “painted cabinet” because I’ve been considering painting mine white. It’s so funny that you found the exact same thing and you painted it white even! Hahah! It looks great! I’ll probably paint mine white now that I can be sure it looks good! I paid 125$ for mine from an old woman from my church! It’s the handiest cabinet! My regular machine and my serger fit inside it. It’s great! 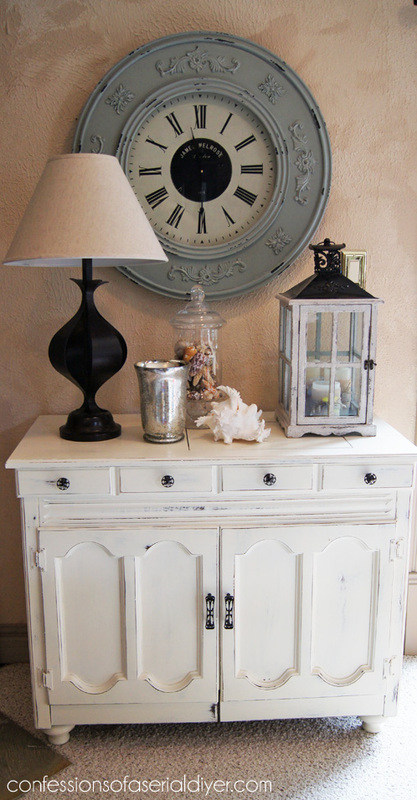 Oh gosh, I just bought this cabinet yesterday and was looking on pinterest for ideas for painting it. Yours is gorgeous! I’m curious to know if you ever found a way to mount your sewing machine in it. I’m trying to figure that out and I’m clueless. Thanks, Danni! I never attached mine since I don’t sit at it to sew, and it fits perfectly underneath. I’m not sure how to mount it. My old machine had two screw holes in the bottom, which I assume were for mounting, but my current machine doesn’t. Sorry I’m not much help! I just snagged this very same sewing cabinet at an estate sale! Very excited about refinishing it. Did you prime it with a darker color of primer or paint first or is it the original color coming through when you distressed it? I just purchased a cabinet just like that!! Took us a while to figure out how everything worked, and I got it at discount of $55! I’ll be painting mine as well, can’t wait! Also have a couple of cane chairs (got free!) to paint, which I’ll use with cabinet…excited! Soo cool!! Hi! 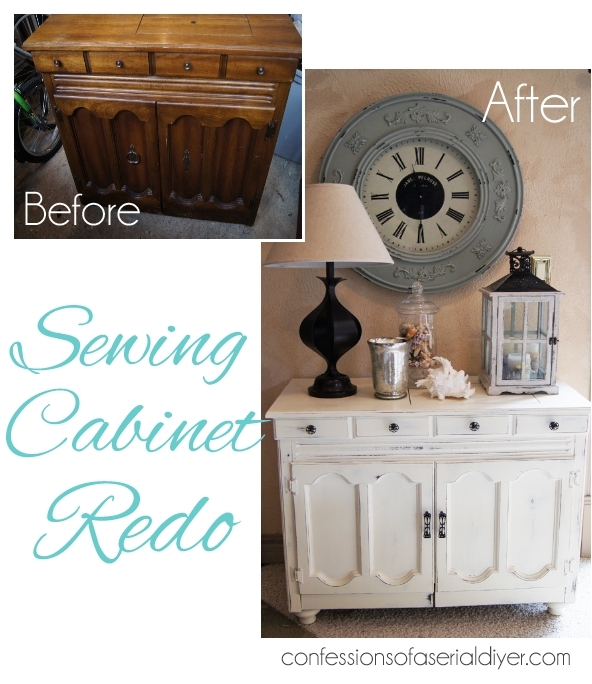 Love what you did to the old sewing cabinet! Great idea. I’m interested in the sewing machine. Do you still have it? Would you be willing to sell it? A friend of mine lost hers in Hurricane Sandy. If you are willing to sell it, please let me know! Thanks, Lisa! I already had a great machine, so I ended up donating this one. So sorry your friend lost hers.